After a week of gridlock caused by Monday’s caucus-busting vote to institute a $2,700 permanent fund dividend, the House returned to action on Friday to undo its vote and replace it with a $1,600 PFD. The $1,600 PFD is still an increase from the one proposed in House’s original proposed operating budget ($1,270), but also comes with a larger draw from the earnings reserve account of the Alaska Permanent Fund (setting it at the governor’s proposed 5.25 percent of market value draw instead of the 4.75 percent draw originally envisioned by the House). The vote to retreat from the $2,700 dividend was 21-14 with five minority Republicans out on excused absences, and the $1,600 PFD was approved on a 20-14 vote. The move had become expected over the last few days as internal struggles within the House Majority Coalition made it impossible to rally the votes necessary to send the operating budget to the Senate (and there were fears that the Senate wouldn’t be able to muster the votes to reduce the PFD). On Monday, a minority faction of the House Majority Coalition teamed up with a majority of the minority Republicans (confusing, right?) 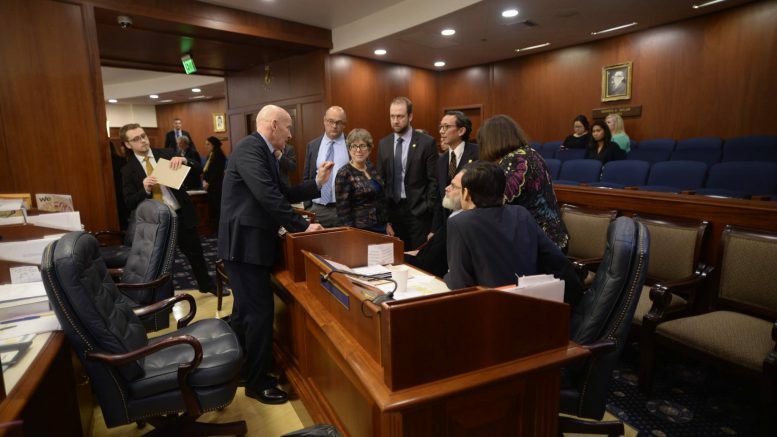 to pass the amendment to institute a full funded dividend into this year’s budget at a cost of nearly $900 million from the earnings reserve account of the Alaska Permanent Fund. That vote was on a 21-19 margin that broke all sorts of political lines in the Legislature. Today, all but four of the House Majority Coalition members that split to support the full dividend retreated from their position in a vote called for by Rep. Paul Seaton, R-Homer. House Speaker Bryce Edgmon along with Reps. Scott Kawasaki, John Lincoln, Justin Parish, Ivy Spohnholz and Tiffany Zulkosky went from supporting the full dividend to supporting its repeal. Key backers of the amendment–House Majority Leader Chris Tuck, D-Anchorage, Rep. Neal Foster, D-Nome, Rep. Geran Tarr, D-Anchorage, and Rep. Gabrielle LeDoux, R-Anchorage–still opposed rescinding the full PFD amendment. Many of the backers of the full PFD said they supported it because the state still didn’t have a full, balanced fiscal plan in place and they were concerned about placing undue burden on Alaska’s poor, elderly and children by relying solely on the PFD for additional revenue to close the $2.25 billion hole in the state’s budget. There seems to be more talk about new revenues now, but no path to action. After the House undid the $2,700 dividend, Seaton re-offered an amendment that would put the PFD at $1,600. That amendment was proposed a week ago, but failed on an 18-21 vote. Today it passed on a 20-18 vote with Reps. Tarr and Sam Kito changing their votes from no to yes. Reps. LeDoux and Tuck were joined by the entire Republican minority to oppose the lower dividend. The amended proposal was ultimately adopted on a 21-11 vote (legislators were leaving throughout the meeting to catch flights home). The vote also happened to be the only vote over the multiple days that the dividend has been debated that was purely along caucus lines. The Legislature could now see movement on the operating budget, though the House still has a handful of other amendments to consider before shuttling the budget into final debate and a vote. Yeas (21): Reps. Birch, Claman, Drummond, Edgmon, Gara, Grenn, Guttenberg, Johnston, Josephson, Kawasaki, Kito, Kopp, Kreiss-Tomkins, Lincoln, Ortiz, Parish, Seaton, Spohnholz, Stutes, Wool and Zulkosky. Nays (14): Reps. Chenault, Eastman, Foster, Johnson, LeDoux, Millett, Pruitt, Rauscher, Reinbold, Saddler, Tarr, Tilton, Tuck and Wilson. Excused (5): Knopp, Neuman, Sullivan-Leonard, Talerico and Thompson. Switched votes: Reps. Zulkosky, Spohnholz, Parish, Lincoln, Kawasaki and Edgmon went from supporting the amendment for a $2,700 PFD to support rescinding it. Reps. Chenault and Pruitt went from opposing the amendment for the $2,700 PFD to oppose rescinding it. Yeas (20): Reps. Claman, Drummond, Edgmon, Foster, Gara, Grenn, Guttenberg, Josephson, Kawasaki, Kito, Kreiss-Tomkins, Lincoln, Ortiz, Parish, Seaton, Spohnholz, Stutes, Tarr, Wool and Zulkosky. Nays (14): Reps. Birch, Chenault, Eastman, Johnson, Kopp, LeDoux, Millett, Pruitt, Rauscher, Reinbold, Saddler, Tilton, Tuck and Wilson. Excused (6): Johnston, Knopp, Neuman, Sullivan-Leonard, Talerico and Thompson. Be the first to comment on "House has second thoughts on $2,700 PFD and votes for a $1,600 PFD instead"